Do you remember back here I mentioned we were getting a new sofa and then everything went quite? 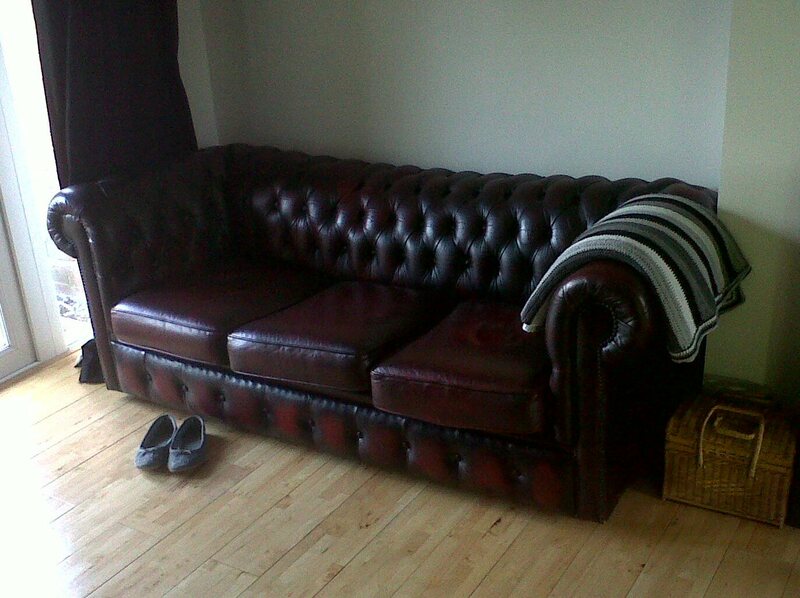 Well we did get the new, well second hand, sofa, I just haven't got around to blogging about it yet. This is possibly because I am feeling ambivalent about it. It is exactly what I wanted and envisioned in my head for that space but for some reason I'm undecided. I like the colour, but I worry it looks too brown (its oxblood red) against the black and grey of the room. Its long enough to lie down on which is fantastic but I'm not convinced its as comfortable as the last sofa. I think for me the main problem is that it makes the chairs in the room look even more out of place. The green old fashioned suite never went with the room anyway, but it goes even less now there is a leather sofa in there. I'm thinking maybe grey fabric ones, the Husbeast would like a high back, I would like modern and removable covers (the Husbeast is an engineer and comes home pretty dirty some nights) so who knows what we will end up with? Please leave me some comments and let me know what you think of the new sofa.